Roast the cashews and raisins in a tsp of ghee (Clarified Butter) and keep it aside. 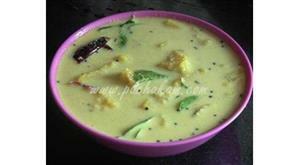 :- If you have only butter, microwave it into a liquid form and pour it into a warm pan. If the pan is too hot, butter becomes black. 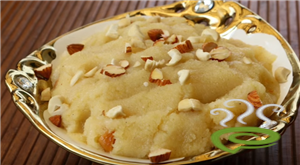 Fry the rava (Semolina Coarse) in a tbsp of ghee, till it turns slight brownish. After the milk boils, add the rava slowly and keep stirring it for about 5 mins. 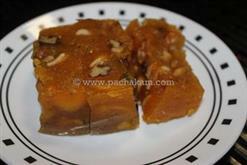 :- IMP NOTE - While adding rava to milk it may become lumpy. If it becomes too lumpy(which it did for me), after the mix has cooled a little bit, pour it into a blender and blend well for nice consistency. Pour the blended mix back into the warm (not hot) pan in small flame. Add the sugar, food colour mixed in milk, cardamom powder, cashews and raisins, while stirring slowly. Keep pouring the ghee in small quantities until the mixture becomes solid and doesn`t stick to the sides of the pan. :- It becomes firm with time. If your pour it into a greased square tin tray /oven tray, while it is still warm and allow it too cool for 8-10 hrs, you may be able to cut it into rectangle/diamond shape. I tried this recipe yesterday... it was really really good... thanks for the warning about lumps. but, it tasted really good.